They’re used interchangeably, but there is a difference. WHEN YOU SIGN up to a broadband service, you’re normally sent out a modem/router hybrid so you can connect via WiFi or Ethernet. While some use the two terms interchangeably, they can be bought as two separate devices, and while that might not seem significant to you now, it’s important if you’re thinking of upgrading your hardware. A modem, short for modulator-demodulator, is a device which talks to your Internet Service Provider’s (ISP) network. Provided you have the correct type of modem – one that’s compatible with the network you’re connecting to – it will communicate with your ISP’s network and translate it so your router can work. This is the device you normally set up in your home for WiFi. 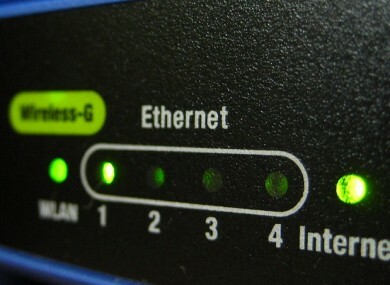 A router shares an internet connection with numerous devices, either through WiFi or by including Ethernet ports at the back. Routers usually come with one or two moveable antennas for you to adjust and a local IP address for each device. But all devices connected to it will use the same external IP address provided by your ISP. While most people are happy with the standard modem they get from broadband providers, some might want to upgrade it so they have a more reliable and consistent connection. If you buy a new router, you will likely have to buy a new modem as well if it’s not supported. Email “So what is the difference between a modem and a router?”. Feedback on “So what is the difference between a modem and a router?”.